I'll be there too. Looking forward! Fabulous reportage of our beautiful country! So many interesting things to see! In case anyone else is interested in sketching in Zürich on Saturday, we will meet in front of the Bahnhof Stadelhofen at 11:00. Hope to see anyone new to the group too! 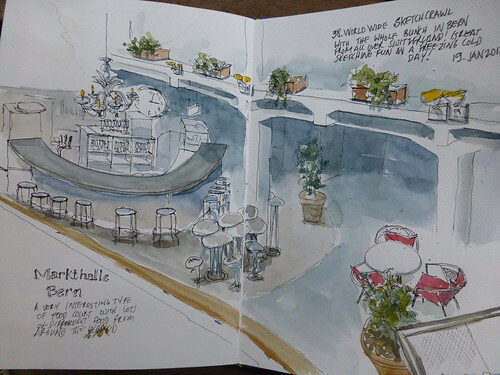 Anyone NOT lucky enough to be going to Barcelona and interested in sketching in or around Zürich on the 13th? I missed the last one due to a broken foot, so I'm really looking forward! I too enjoyed meeting so many swiss sketchers! It was a fun day with great sketching opportunities. I look forward to a wintery sketch day too! Wonderful sketches! The circus tents are great subjects, well done. Love the pumpkins too. Thanks all. Sounds great Yves! Ohh too bad about the cold. Hope you feel better soon. I'll be going anyway as I like sketching in town. See you hopefully the next time. Last time we met at the Zürich HB under the Angel. That worked well. What time? Yes, looking forward. Where shall we meet?